Envelope yourself in this sophisticated pointelle jumper that’s sure to be on high-rotation all season long. 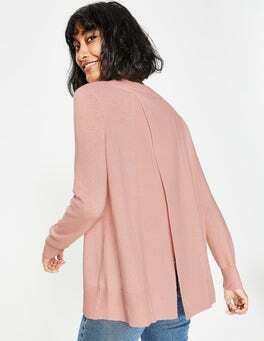 Cosy enough to wear all-day and classy enough to take out at night, it has a touch of mohair for a luxurious feel and it drapes beautifully for a flattering fit. Statement. Balloon. Sleeves. We can't think of a better way to introduce our relaxed-fit jumper. The supersoft fluffy yarn is elevated with an all-over stitch and a boat neck. This is the perfect piece for those running-out-the-front-door mornings – or, as we call it, every morning. 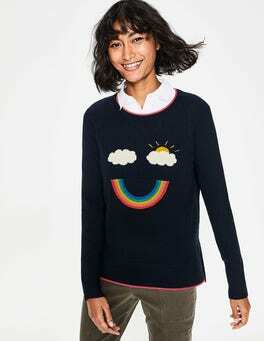 Your wardrobe will never be lacking with this playful jumper. The wool-and-cotton mix makes it soft and easy to wear, while the delicate frills on the sleeve and neckline amp up the feminine style. What happens when tactile ribbing meets pointelle stitching and blouson sleeves? You get a thoroughly modern jumper that knows how to stand out from the crowd. With a touch of alpaca for extra snugness, simply throw on with jeans and start turning heads. We're not usually ones for cricket, but we'll make an exception for this jumper. This soft merino wool blend meets a longline fit to make this your perfect weekend go-to. The contrasting stripe on the neck, sleeves and cuffs will definitely earn you a place in the First Eleven. What’s that, you’re looking for the perfect I-just-threw-this-on jumper? Then slip into our casual knit with chunky stitch detail. Long-sleeved, and with a grown-on neck, it was quite literally (yes, literally) invented for cosying up with a pint after a nice country walk. Specific, yet idyllic. Want to add instant elegance to your day? Slip on this neck-tie jumper. It features a hint of cashmere for ultimate softness, plus a fitted shape and three-quarter-length sleeves for extra flair. A merino-wool blend with a dash of luxe cashmere – what more could a girl want? How about some vibrant, rainbow designs in contrasting colours? Okay, we'll throw some of those in too. This jumper is super comfortable thanks to the relaxed fit making it the perfect partner for skinny jeans. This jumper has a clever trick up its (long) sleeve – turn it around to reveal a completely different shade. Knitted from 100% soft merino wool, the relaxed fit makes it a perfect all-day comfort piece. Add in colour-pop tipping and you have a trusted classic with a twist. As if the supersoft merino blend wasn't enough, this jumper is bursting with character too. Decorated with a choice of fun designs, it's the life of the party (or just extra fun during a stroll in the park). Pops of colour at the cuffs and contrast tipping complete an everyday, playful look. You've got the weekend on its way – all you need is a cosy oversized roll-neck to really wind down. And, as if by magic, we have just the thing. This 100% merino wool number is seriously indulgent. The drop shoulder keeps things relaxed while you go about your day in supremely comfortable style. Soft and chunky, playful and practical: we like a contradictory jumper. This one has a hint of cosy cashmere and its relaxed shape means it's ideal for layering. The wide drop-shoulder sleeves make a style statement, and contrast colourblocking in eye-popping shades accentuates the effect. BRB, just having coffee with the girls/reading the paper/enjoying a nice glass of red. The possibilities are endless in this easy, 100% merino wool, weekend jumper. The stand collar elevates the relaxed shape for 'oh, this old thing?' casualness. The snuggle is real with this cosy raglan jumper. A hint of cashmere makes it worthy of afternoons spent with your latest reads, while the flowing shape, dipped hem and bold pops of colour make it a winner in the outside world too. Warning: snuggle into this soft roll-neck jumper and you'll never want to take it off. A risk worth taking, we think. With a touch of cashmere, a longline shape and tipping at the hem and cuffs, this luxurious knit nails casual chic. Wear with the matching joggers for ultimate relaxation. Who says smart has to be sensible? Get the details right and it can be sophisticated. Made from a merino-and-cotton blend, this soft fitted jumper has a flattering drape. 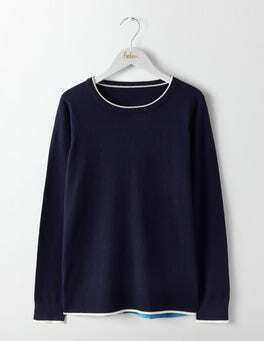 It features long sleeves, an understated crew neck and fine buttons running from cuff to elbow. 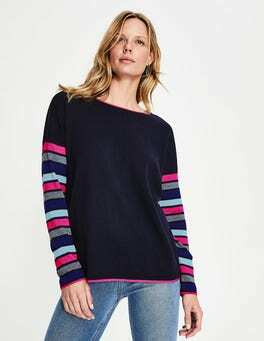 Weekends are more cheerful when you slip on this relaxed jumper. Rainbow cuffs are matched with a bold stripe down the back for a playful, flattering look. The crew neck and ribbed hem mean it's perfect for throwing on when the temperature dips. 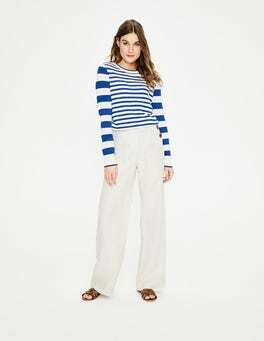 Sail across seasons in this nautical-stripe jumper. 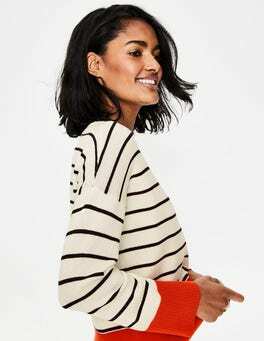 The crew neck and semi-fitted design are feminine and flattering, but it's the sleeves that really make a statement. They're three-quarter length and flare from the elbow to create a bell shape that lends volume to your outfit. On chilled-out weekends you can’t beat the cosy feel of this wool and cashmere jumper. It's indulgently soft (and goes in the machine too) while the boat neck style and textured stitch give it an effortlessly carefree finish. Pull it on with a pair of jeans for that blustery beach walk.